Years ago, when I purchased my first house I made a pair of balloon shades (yes it was the 80's) for my guest room. They were really lovely, in a pretty peach (I told you, 80's) print. I wanted to make ruffles for the bottoms. My first attempts using the traditional method of using a double row of basting stitches that you then draw up just did not work. So I researched (trip to the library, no internet remember, the 80's) and found a great, fool proof method for making ruffles. This method works for any type of ruffle but especially when you are working with a long length of fabric or bulky fabric. There is one, indispensable tool necessary for this method. Yup, dental floss. Just your plain garden variety unwaxed dental floss. A must have for any sewing kit. For demonstration purposes I am working with a five inch strip of fabric that I have pieced together into a 2 yard length. I then folded it wrong sides together and pressed. First insert a straight pin into the very end of your strip. Wrap the dental floss around it a few times to secure it. 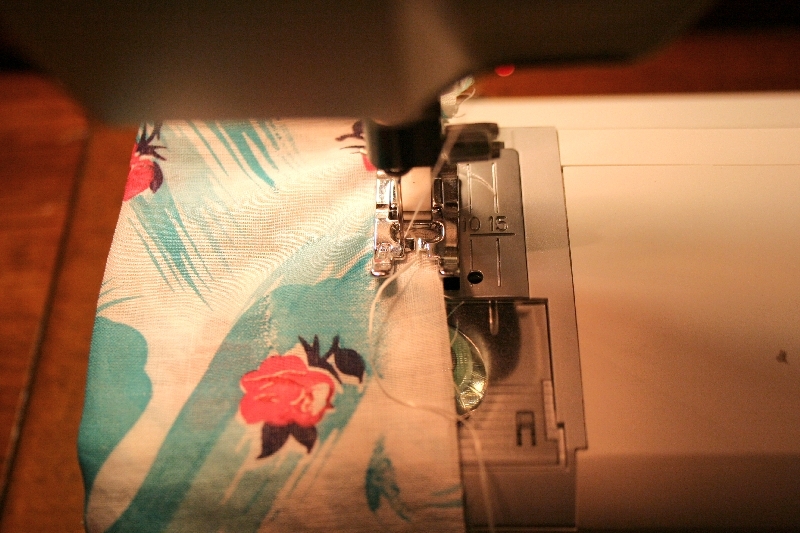 Set your sewing machine on zig zig with the longest stitch length and stitch width. Now stitch over the dental floss, encasing it with the zig zag stitch. As you stitch along you can keep the floss somewhat taut and that will begin to gather your ruffle. When you get to the end, don't cut off the floss and leave yourself a very long thread tail. 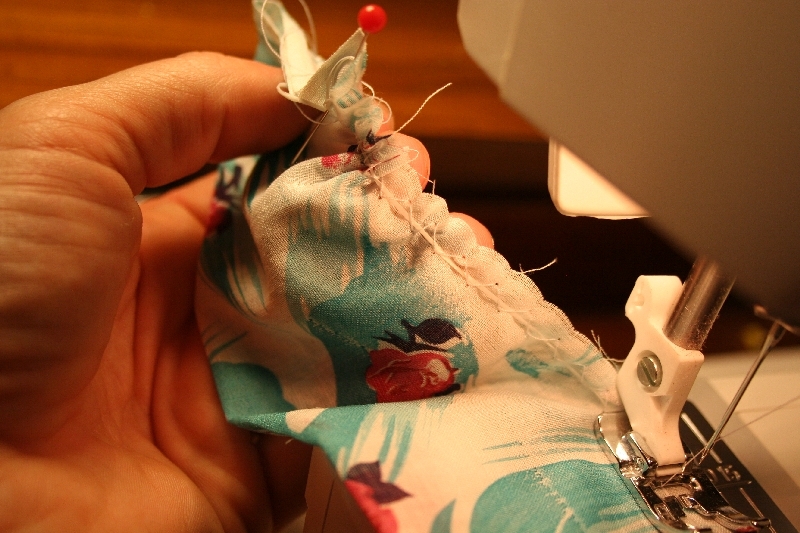 Take the ruffle to your piece and it is easy peasy to adjust it to the correct length. Pin, sew, Voila! I hope this technique is as helpful for you as it has been for me. I use it every single time I make a ruffle. It's quick, easy and fool proof!! Thank you Suzy! Who would have thought, dental floss??!!!! That’s great!!! Well, that is just amazing. I’m feeling the need to make a ruffle just to try it out! Thanks for the Neat tip! I will be trying this in the very near future! What a fantastic trick!!! I’ve never tried ruffles before because I’m afraid of them. 😉 Now I am no longer afraid! Thanks! Who knew? great tip…. I don’t do much sewing yet…but some day when I do…I know I will give a cute little ruffle a go. I have a loosely woven plan to make an apron for a little girl. jeez. happy mothers day to you. once again, you have taught me another coolio thing to do. thank you for that incredible and clever way to do what has up til now been tedious. and i thought that dental floss was best for cutting logs of chevre and torting cakes into layers. now i know another fab trick . I never heard of using floss before but that is a great idea – thank you for sharing it. I’ve made ruffles before and it does get frustrating pulling on regular thread that breaks easily…I’m gonna try this. Thanks for the tip on ruffles. They always are a pain in the….well a pain. Come for a visit. Oh my goodness….I feel the need to RUFFLE with this tip! Brillant! I too feel the need to ruffle something. I have an apron pattern that has ruffles; might get it out and give it a whril.